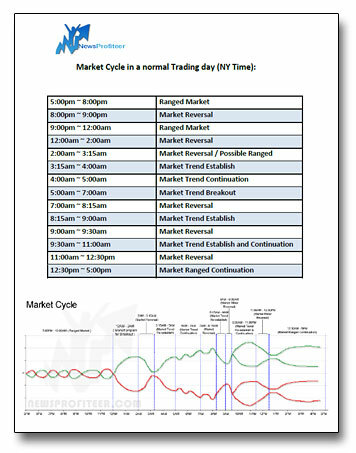 Market Cycle times, the Natural Rhythm of the market that occurs regularly on a daily basis. Understanding these patterns would provide a great advantage. Click below to download a copy of the Market Cycle Timeframes to watch for market trend continuations and reversals. Market cycle is based on years of data on how the market reacts during certain time of the day. As most traders will tell you, even though the Forex market is open 24 hours a day and you can trade 24 hours a day, it doesn’t really mean that you should. Some traders will even go as far as saying that you should only trade the currency during the time its market is open. But after seeing how the market reacts time and time again, the optimal approach is to take advantages of the timing and not to avoid the market altogether during certain times, that’s what the theory of Market Cycle is based on. So to take advantage of Market Cycle, one has to study their routines, and learn their patterns… The market cycle diagram will give you a good starting point.